Each month I plan on posting where automotive companies are with their fan love on the popular social networking site Facebook. This is the first of what will be monthly reports that will be posted to this blog within the first few days of each new month. I have been tracking data since September 14, 2009 but have been doing it in no particular regularity until November. The data here looks at fans as of December 01. Any percentages of change in the graphs are comparing fan changes from 11/3/09 to 12/1/09, basically a month’s change in fans. The leader board may tell us something about changes in brand perception over time, but that remains to be seen as data collected builds. If anything, much of what we see today with fans on Facebook are a few isolated large-scale marketing campaigns designed to get people to fan (e.g. Honda’s recent Everybody Loves a Honda campaign) and mostly it shows brands with very high socially acceptable brand association. What I mean by the latter is that people are likely to fan brands like Porsche, Aston Martin, Audi and Mercedes-Benz because they are highly aspirational brands that people want to align themselves with in their social network. It’s very socially acceptable to say I’m a fan of Porsche than say a Kia. Current fan counts tell us more about social braggadocios behavior and big campaign pushes to get fans. 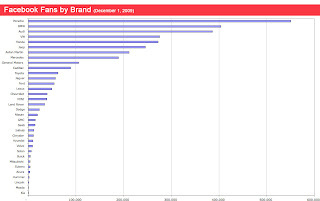 The largest fanned brand on Facebook is Ferrari at 681,329 fans as of 12/1/09. Lamborghini used to have 823,776 fans back on 9/14/09, but they have since revived their brand page and are rebuilding at a new count of 241,257. I decided not to include the super car brands because they skew the data too much when looking against the main automotive brands and finding correlations with sales. What the Ferrari, Lamborghini and, yes even, Porsche brands tell us about fanning on Facebook is that highly aspirational products will grow organically. Audi and Mercedes both show a high count of fans. They too are aspirational brands. 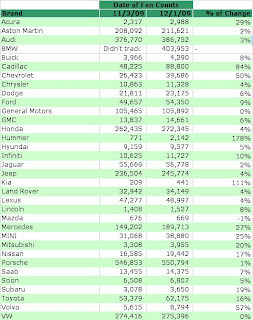 Three brands that are not as aspirational are Jeep, VW, and Honda all of which have very high fan counts. 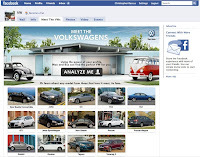 VW recently ran the first ever Facebook fan campaign when they launched their “Meet the VWs” effort last May. Honda followed their lead with the “Everybody Loves a Honda” campaign that ran TV ads, online media (in and out of Facebook) and email marketing communications promoting the idea of going to Honda’s Facebook page. The Honda effort began last August and went full speed in September and October. 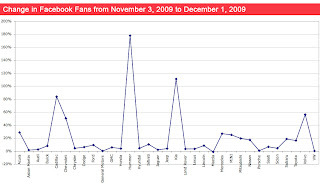 They went from 22,806 fans in 9/14/09 to 262,435 fans by about the time the media ended, resulting in 1,050% increase in fans! I wish I had more historical data on Jeep. I know they did a lot of early Facebook applications like Boostin’ Nuts and did a lot of outreach to their online communities. They were also one of the best-organized automotive brands on Facebook. Facebook used to give brands much more customization of the brand pages and before that changed this year, Jeep was one of the best examples of Facebook marketing on a brand page. I’m guessing most of their growth came when they were early adopters of the platform, but that is a guess as I don’t have the numbers. The remaining brands are all over the place. Some brands advertise a lot on Facebook – Lexus, Cadillac, Chevy, Infiniti and Acura to name a few. Most brands also advertise nameplates like Ford with Mustang and Fusion. Chevy has done a lot promoting the Camaro and Cadillac SRX. One of the biggest jumps in fans comes from Volvo this past month with a 57% increase, attributable to their What Drives Edward campaign aligned with the Twilight: New Moon film. Fan numbers for non-aspirational sports car or luxury brands have more to do with advertising on Facebook to attract fans to their pages on the site. I’ve seen this happen a few times in watching this closely since early September. For example Chevy and Cadillac have been running several ads on Facebook this past month and have seen nice jumps of 50% and 84% since the prior month. Kia also saw a major gain of 111%, attributed most likely to their latest campaign for the new Forte. HUMMER is the most intriguing here. The brand has basically no marketing presence and was recently bought by the Chinese firm Sichuan Tengzhong Heavy Industrial Machinery Corp. back in October. Fortunately they did have some events that helped their social visibility, like Rod Hall Racing winning with a H3 at Baja 1000 last month. Nick Richards, HUMMER Manager of Public Relations, shared,"The HUMMER Facebook fan page, which was only started 8 weeks ago, has likely benefited from recent promotions and active outreach on the part of the HUMMER social media team to existing global HUMMER Club members." MINI is a special case too as they just recently switched from promoting their MINI USA Facebook fan page to a global MINI fan page. The brand has been building up their fan base on the new page since the move a couple months ago. So I’ll post this data on a monthly interval for all to see. Consider it my blog’s version of Autoblog’s “By the Numbers”. Hope you find it useful and please let me know what you’d like to know from these numbers? I do plan on comparing fans to changes in market share, how product launches may affect fans, major brand advertising campaigns, or other similar comparisons to see if any correlation exists or to see how a particular campaign is impacting fan trend. Thanks for reading and I hope this becomes a useful exercise worth reading and tracking. Isn't this BMW's official fan page? Does anyone know if BMW converted a non-official page to an official page recently? This is a fairly common practice, happened most notably with Coca-Cola. Thanks again for the catch Shawn! Yes, the BMW switch is recent. For a long time it was managed by a service shop/small dealership in Spain I believe. As a ten year member of the BMW CCA, I'm glad to see they finally took the page over. Thanks for the clarification. I figured that's what happened when I returned to Facebook to find the official BMW, I was already a fan. Also, thanks for supporting the BMW CCA I have been a member for 12 years. It's a great club and a far better way to show you're a fan than any Facebook page.